To use WAREOS, each MA Extranet Admin user or a multiple user who has specific privileges assigned within your member association need to log-in into the Extranet. Please note that your member association WAREOS' account is no longer available functionally. The World Ranking Tournament is OPEN to all World Archery MAs. WRT comprehenses all individual and team categories including: Men/ Women Compound OPEN, Men/ Women Recurve OPEN, Men/ Women W1, mixed teams, Visually Impaired 1(combined) and Visually Impaired 2-3 (combined). The European Cup Circuit is determined for the World Archery Europe MAs. Results of the European Cup Circuit are based on an accumulation of points that individual archers (except V.I.) and national mixed teams obtain at both events in Olbia (ITA) and in Nove Mesto (CZE). There is NO LIMIT of number of entries per category per country, neither for the World Ranking nor for the European Cup. For any questions regarding WAREOS contact the World Archery Office, Mr. Jae Kyung LEE (jklee@archery.org), please. Be aware that teams will not be able to enter or update data in WAREOS after the deadlines. If teams wished to make any changes to their Final Registration after the deadline, Mr. Jae Kyung LEE should be contacted. Final entries processed after the deadline will result in a penalty fee of EUR 50,- per archer to be paid to LOC upon arrival. 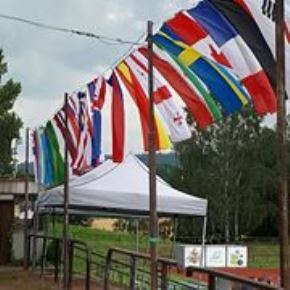 Final registration that differs by more than four (4) archers from the preliminary registration or have been submitted after the preliminary deadline (without preliminary entry made before) will result in a penalty fee of EUR 150,- to be paid to LOC upon arrival. Note: late entries can be denied or may cause troubles with convenient accommodation and local transport due to limited accommodation capacity. Suitable accommodation capacity is limited. LOC has contracted up to 320 beds for the tournament. Participants are expected to share double-rooms. LOC allocates accommodation to teams based on their size, men/ women ratio and number of wheelchair users unable to stand/ walk. In all the above contracted hotels there are wheelchair accessible toilets at lobbies, too. Most of the rooms are suitable for wheelchair users. Check-in time, if not agreed otherwise, on Saturday, July 6, 2019 afternoon. Local transport: from Prague Intl. Airport to the venue and back as well as between hotels and venue will be arranged by LOC upon request of the teams (LOC will extra charge EUR 80,- per person per the local transport through the tournament). Teams may also„rent-a-car“ for reduced price at the Right-Cars rent-a-car with pick-up and return at Prague Airport. For more info contact barbora.misikova@right-cars.cz, please. EUR 800,- per participant (including accommodation and meals from dinner on Saturday, July 6 through breakfast on Sunday, July 14). Classes/ Divisions: Recurve Open, Compound Open for Men and Women (Individuals, Teams, Mixed Teams), Compound W1 for Men (Teams/ Individuals) and Visually Impaired. Visually impaired archers with a "review next event" status are not allowed to shoot. Archers who are already classified on a WA tournament are allowed to shoot in their respective category. The classification will be held on Sunday 7th of July, 09:00 to 18:00. It is the responsibility of the teams that archers who have to be classified arrive in time for the classification session. That means that they have to arrive at least one day before the date of classification. Classifiers will not build the classification schedule in regards to teams arriving on classification day. The Form is available on https://worldarchery.org/Para-Archery. Should this information not be submitted by email before this date, such athlete will not be classified and therefore will not be eligible to participate in the event. For physically impaired archers classification will be held on the same location as the field of play. Note: if needed simply add further lines to the above tables, please. Note: LOC arranges for local transport from and to Prague Intl. Airport only. No. of Team members: _____________ x EUR 80,- = EUR ______________,-. 30 percent of the Participation&Transportation Fees should be transfered not later than in April 6, 2019. 30 percent of the participation Fee should be transferred to the LOC Bank Account by April 6, 2019.